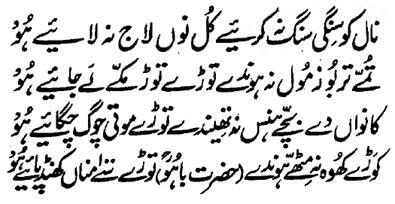 Hazrat Sultan Bahu Rahmatu-Allahe Ta-aala Alaihe says that 'one should avoid the company and association of the bad and incapable people otherwise they disfigure the whole case of whole society and all circle of friendship. Incapable persons are bitter like Tumma (desert gourd or bitter cucumber). They do not become sweet by turning into a watermelon even if they are taken to Khana Ka'ba and Holy Mecca. Moreover, baby crows cannot become Hans birds (Hans) no matter how much pearl like feed is given to them. In addition, those wells, which have bitter water, these cannot become sweet even if we add hundreds of kilograms sugar. Hence, those, who are the Shaqee, incapable and unblessed ones since the Day of Azal, even the company of the Holy Prophets and Aulia-Allah gives no effect to them. In the garden of Mustafa Sal Allahu Alaihe Wa Aa-lehee Wa-sallam , blessed persons came from far off places like Hazrat Hassan-Basri Radhi-ya-Allahu Ta-aala Anhu from Basra, Hazrat Bilaal Radhi-ya-Allahu Ta-aala Anhu from Habsha and Hazrat Suhaib Radhi-ya-Allahu Ta-aala Anhu and received the Beneficence and quenched their thirst but the unblessed persons from locality like Abu Jehal remained deprived of and unblessed besides the fact that he lived in the vicinity of the Holy Prophet Sal Allahu Alaihe Wa Aa-lehee Wa-sallam because his nature was bad and unchangeable.